Immediately after taking my first bite of this salmon, I rolled my eyes back and chucked my fork onto the counter in a state of euphoria. I’m not dramatic; you are. If you’ve been following my blog for a while, you already know that I’ve (eagerly) made it my mission to convert salmon skeptics into salmon enthusiasts. First and foremost, salmon is incredibly good for you. It’s high in omega-3 fatty acids, it’s a high quality protein and it’s jam-packed with vitamins and amino acids. Further to all that, in my experience, it’s done wonders for my skin. When I’m eating salmon on the reg, I develop a noticeable glow. This recipe is loaded with umami flavors, so if you crave the essence of umami on the reg like I do, you need this salmon in your life. I mean. I haven’t stopped thinking about this fillet since I ate it. Maybe it’s due to the fact that I’m new to the miso game. The first time I cooked with it was just a few weeks ago when I made this Miso Ramen. It was a delight, and I knew I needed to get to know the stuff on more than one level. I mean, a bowl of this good stuff would have you obsessed pretty quickly, too. So I glazed my salmon with it. And then I baked it. And it was dreamlike. Let’s not ignore those soba noodles though, k? Because they are exquisite! Yes, exquisite; we’re pulling out the highfalutin’ words for this one. Soba noodles are just these hearty buckwheat flavor bombs that taste as wholesome as they look. They also pair perfectly with toasty sesame, soy and ginger flavors, so incorporating them into this dish was a no-brainer. Really, you’re getting two recipes in this post. You could have either of these things on their own, but trust me — you want both. 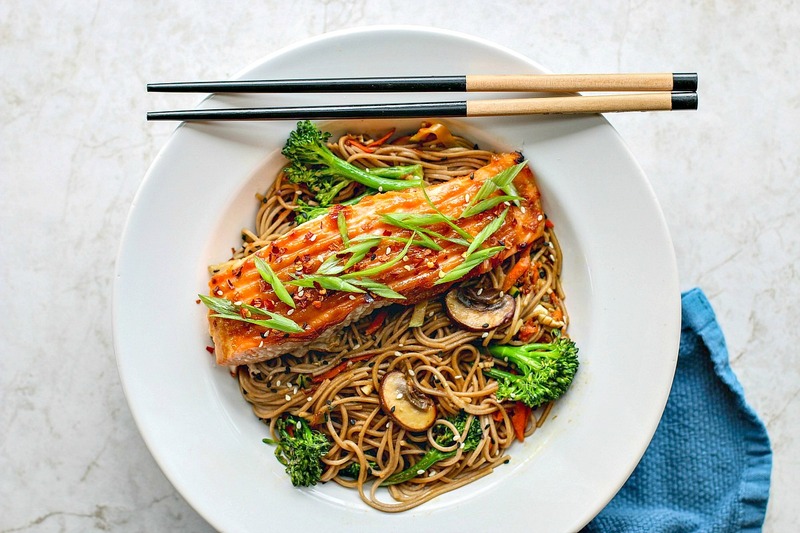 This healthy and umami-packed Miso Glazed Salmon With Sesame Soba Noodles makes for a perfect nourishing lunch or wholesome dinner. Lightly grease a baking dish or pan for the salmon. In a small bowl, combine the ingredients for the sesame sauce. Whisk roughly with a fork until combined and set aside. In another small bowl, combine all of the ingredients for the miso glaze. Roughly whisk with a fork until well combined. Evenly slather the glaze over the fillets. Bake the fillets for 15 minutes or until flakey and opaque in the middle. Heat the oil in a large saucepan over moderate heat. Add the garlic and simmer until fragrant, stirring often to prevent browning. Add the broccolini and mushrooms and toss to coat. Simmer over moderate heat until tender, approx. 5-7 minutes. Add a tad more oil if your pan dries out. Once the veggies are tender, bring heat to low. Add the zucchini and carrots, stir to mix, and cover pan to keep warm. Prepare soba noodles as per directions on packaging. When the soba noodles are ready and have been drained, add them to the saucepan with the vegetables. Add the sesame sauce and toss to coat. Divide the noodles and veggies into two separate dishes. Top each dish with a fillet of salmon. Hello! would this recipe use light or dark miso? The recipe indicates baking the salmon at "425 degrees C" --- which would be about 800 degrees F... I'm guessing that's a typo? In any event the miso glaze looks A+++, making tonight! Bro's love to glow too! Or, at least, this one does! You've perfectly cooked that salmon, I can tell and it looks wonderful! I want's it. Haha, I hope you did/do make it and I hope you love it, Jen! It's def one of my faves. Love the combination of flavour and textures here! Next time, include a video of your eyes-rolled-back-reaction, mmmkay? Miso and salmon are simply BFF's. You reminded me that I have some in my freezer to use up! Thanks for this great recipe. Hahaha, if only I had a compilation of my reactions when I eat good food. Oh boy. I agree, Miso + Salmon = besties forever. We have salmon quite regularly, and love it! And we also love soba noodles but have not put the two together, so thank you for your recipe, we're going to make it and roll our eyes back in pure delight ;-) . There are salmon skeptics in this world? Hard to imagine. This looks incredible and I'm bookmarking it for those days I fall of my veg wagon. Right? I shake my head at them ;) Thanks Tiffany, I hope you enjoy it as much as I did!